A few months have past since I originally wrote up PICO Holdings, and a few catalysts have taken place which could monetize some of their long term assets and drive book value higher in 2013. The biggest catalyst was the announcement earlier this month that PICO Holdings' home builder and land developer subsidiary, UCP, filed for an initial public offering. The preliminary filing shows PICO selling $125 million worth of UCP shares but still remaining as the controlling shareholder (holding the majority of the voting shares). The book value for UCP is approximately $102 million, so if PICO sells 49% of UCP for $125 million (the exact percentage is left blank), UCP would be valued at 2.5x book value. Taking a quick look at the other home builders, who have certainly run up considerably in the past year, a 2.5x book valuation seems slightly high but also within reason. While UCP would be considerably smaller than other home builders, it does have the advantage of being focused on relatively healthy markets in California and Washington, along with having purchased most of their lots in 2009 and 2010 at depressed prices. Hopefully the poor home builder sentiment numbers released this week are not a sign of things to come, and UCP is able to come to market. A 2.5x book valuation would increase PICO's book value by $153 million, or an additional 29%. PICO's water assets are also benefiting from the recent bottom and subsequent upturn in the housing market. It's hard to put a value on the water assets, as they are very long term in nature, but CEO John Hart's consistently comments that their carrying value on the balance sheet is understated. There has been some sale activity as PICO's Vidler Water recently entered into an option agreement to sell up to 7,240 acre-feet of water rights to a planned power generation plant in Lincoln County, Nevada, at a price of $12,000 per acre-foot, maybe a sign of things to come? Starting in August 2012, Northstar (88% owned by PICO) started full production of canola oil/meal and by year end generated $85 million in revenues, or about $19 million per month. This should be a conservative number as PICO has stated that the plant was running at less than full capacity as it was ramping up production. In John Hart's recent annual letter, he states that similar food processors are selling for just under one times revenue. If you annualize the $19 million per month (again, a very conservative number), Northstar should generate at least $228 million in revenue, taking 90% of this number and you get an enterprise value of $205 million for Northstar, take out the $95 million in debt, you get $110 million in equity, of which $97 million is attributable to PICO versus a balance sheet value of $59 million. However, it seems like Northstar's value to PICO is rooted more in its ability to generate free cash flows that could be used to fund additional investments. The covenant default late last year seemingly spooked investors, so as results come in for 2013, hopefully there's significant improvement in Northstar's performance. About a year ago, Warburg Pincus invested $15.2 million into Spigit, a enterprise social media company, valuing Spigit at about $212 million, which PICO owned 28%. It's probably safe to say this was an extremely lofty valuation, but PICO still sees potential as it invested $5 million in the first quarter to acquire an additional 17% voting interest in the company, with the potential for the ownership to increase to 67% by the end of the first quarter. PICO will be consolidating Spigit on the balance sheet starting with the first quarter results. It will be interesting to see if PICO, with its new controlling position, is able to turn around the operations or monetize the company in some way, unlikely, but maybe a possibility a few years out. At today's prices, PICO is trading for 1.1x book value, that is still too cheap given it's collection of assets. I continue to have concerns regarding management's lack of ownership, but the UCP announcement at least shows the desire to monetize their assets, grow book value, and collect their incentive compensation. A quick back of the envelope calculation puts the current EV/EBITDA at just under 8 times. 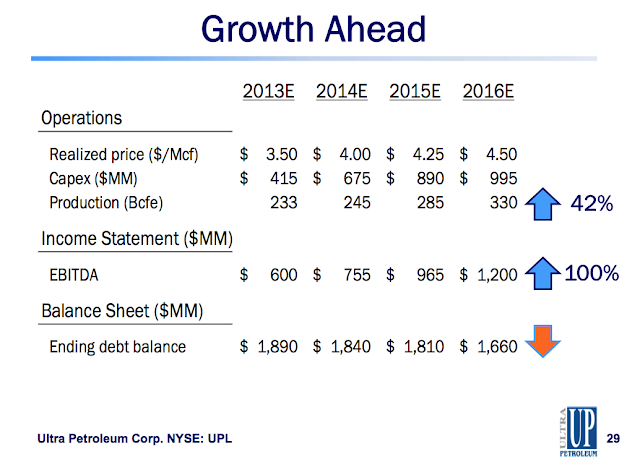 Holding that multiple constant and using Ultra's projections for production growth and debt reduction produces the below result as the growth in EBITDA accrues to the equity (170% higher by the end 2016). Obviously there are a lot of assumptions baked into these numbers, but it shows the opportunity Ultra has to monetize their early life natural gas assets in a normalized pricing environment. If you believe natural gas prices have stabilized, meaning producers show some production restraint now that the market has recovered, Ultra could be a clear winner over the next several years.